Please join us for interdenominational worship at 10 AM on Sundays throughout the Summer season. 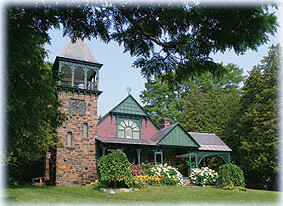 Grace Memorial Chapel on Lake George was organized as a non-denominational Christian place of worship on August 11, 1884. In 1984, it was placed on the National Register of Historic Places because of its age, its beauty, and the fact that it represented an early work of William B. Tuthill, the designer of the Carnegie Hall, and was an early example of pre-cut framing. Grace Memorial Chapel was awarded the AARCH Award in 2008 for the stained glass restoration project. Support for the maintenance and preservation of the Chapel is derived primarily from the generosity of worshippers and friends, like you. You are invited to participate in this support. Memorials in memory of loved ones are encouraged. Please contact Debbie Gall at (518) 439-0455.